Click on a software title or image to learn more or make a purchase. Links will take you to Amazon where you can read product details and customer reviews or directly to the manufacturer's or authorized dealer's website. Crazy Machines 2 takes you on an incredible world tour and put your skills to the test with challenging puzzles from around the globe. But that’s not all: the game is exploding with new elements to play with, allowing you to create even more complex and astounding gadgets and machines. A reworked physics engine allows for seriously realistic and in-depth gameplay. Designed specifically for kids, JumpStart Typing gives children a critical technological edge with a product that's fun to play and easy to use. The perfect typing solution for young students. Repetitive training and interactive demonstrations and activities help students build typing proficiency. Learn and practice proper keyboarding technique, build accuracy and speed at the keyboard, and foster correct hand placement and body posture. Grades 2 to 5. Kid Pix Deluxe 4 has all the creative functionality one would expect, from selecting from an array of art mediums (paint, watercolor, airbrush, pencil, crayon, marker, chalk, etc.) to using various finishing techniques (stickers, stamps, typeface, etc.). In addition, the software can add special effects (animate, smudge, smear, warp twist, etc.) for a wacky look, suggest ideas and backgrounds to help get creative juices flowing, and import digital photos to personalize. 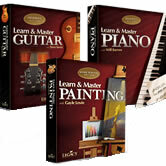 The Learn & Master Home School Painting, Guitar, and Piano Lessons are complete two-year curricula designed for home study. The Home School Editions include DVDs, music CDs, lesson books, and teacher's guides. No previous experience is needed. Mavis Beacon Keyboarding Kidz is the perfect software for children and 'tweens who are either learning to touch type or want a fun way to improve their keyboarding skills. Mavis and Dex are helping out at the movie concession stand, and they need your help when there's a mad rush between shows! You can help take orders, but only after you've mastered the keys from A to Z! Set words-per-minute goals, see what keys your child needs to practice and what keys he or she knows well. Ages 7 and Up. Mavis Beacon Teaches Typing Platinum 20 is the most comprehensive typing instruction system and now includes updated learning tools, an improved user interface and even more features. Whether you want to learn essential keyboarding skills or improve overall typing efficiency, Mavis Beacon will guide you step-by-step on your road to success! Improve speed and accuracy with detailed assessments, customized lessons and skill-building games. For typists of all skill levels.